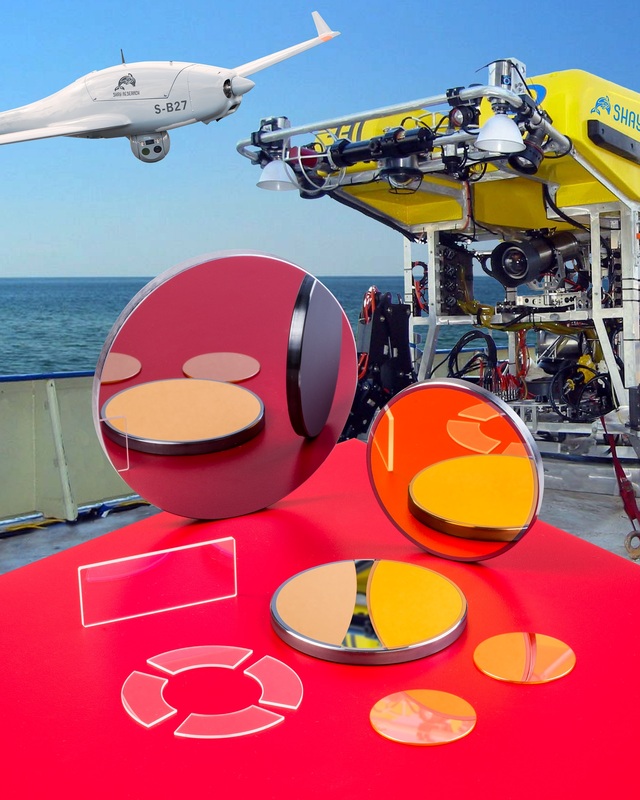 Custom fabricated sapphire, germanium, and zinc selenide optics for use in gimbaled systems and front surface protection in unmanned air- and undersea vehicles are available from Meller Optics, Inc. of Providence, RI. Meller Optics for unmanned vehicles feature sapphire which is second only to diamond in terms of hardness and provides outboard surface protection for imaging sensors by withstanding sand, saltwater, and other fast moving particulates. Optics for gimbaled systems include sapphire, germanium, and zinc selenide for applications from the mid to far IR, and they can all be fabricated to customer specifications as lenses, mirrors, and windows. Available in a wide range of shapes and sizes from 0.25” to 10” dia., with varying wall thicknesses, Meller Optics for UAV and UUV applications can incorporate stepped edges and elliptical edge shaping, holes, slots, and wedges for mounting. Flatness can be held to 1/10th wave in the visible and < 2 arc sec. in/in parallelism, with surface finishes from 60-40 to 10-5 scratch-dig, depending upon material and configuration. Meller Optics for unmanned vehicles are priced according to material, configuration, and quantity. Price quotations are available upon request.